A rare piece of Saskatchewan paradise, 318.49 acres, 2 ranch quarter sections with farm house on property, 1051' (on one level) One & a half story 4 bedroom 1.5 bathroom. 2 wells & dugout, septic to pump out. 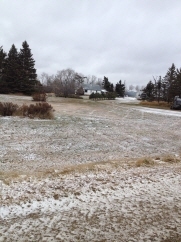 7 leases attached to this property, could be transferred to new owner with Sask Ag approval. Quonset & barn included.